January 23 is CSP’s dad’s birthday. Yesterday we decided to meet up for coffee. CSP & I had some errands to run first. I had lunch with Holly (one of my oldest & dearest friends who lives in Arizona now). We had the always fab soup & salad & breadsticks deal at Olive Garden. We talked for 2 hours and could have talked even more if she hadn’t had to catch a flight. Plus we were getting the stink eye from our waitress for hogging a table for 2 hours on a very busy day. Holly is one of my very favorite people in the world. The kind of friend where when you get together it’s as if no time has passed at all. But man, has time passed. Her daughter was just 3 years old when we met and now she’s going to be 15 shortly. Wow- we’re old! But we still feel like kids. I could go on….but on to the goose chase… *Disclaimer- normally I wouldn’t give you a play by play like this (you can see that on Foursquare), but it’s essential to the story. So I went home from lunch and picked up CSP. We headed to IKEA first to buy a tray for under the pugs’ water dish. Their old tray broke when CSP knocked the giant spoon off the wall. The pugs get water everywhere if there isn’t a tray under their bowl so this was a must. I was proud we got out of IKEA with only spending $6. It’s easy to do when you’re poor! Isn’t the new tray cute? 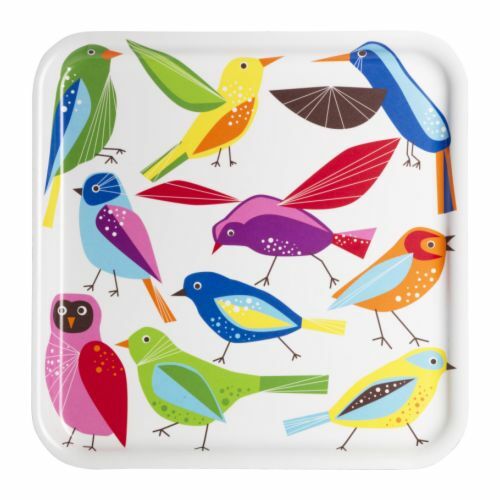 Love the birds & colors.